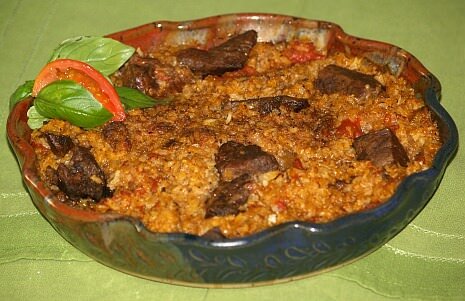 Beef and rice recipes are great one pot casserole recipes , they can be served side by side to compliment each other or cooked beef recipes sometimes is served over the top of hot rice. Whichever way you choose to serve these two ingredients they go well together for a delicious meal. Different spices and ingredients combined in these beef and rice recipes give influence of different cuisines around the world. A Spanish rice recipe or Mexican recipes are often seasoned with garlic, onions, peppers, tomatoes, chili powder and cumin; making the dishes well seasoned and often spicy hot. In the Asian cuisine these dishes are often seasoned with soy sauce, peanut sauces and spices like ginger. In the United States many beef and rice recipes might be simply these two ingredients with a can of mushroom soup, cream of chicken soup or cream of celery soup. In all cuisines you will find a variety of vegetables like broccoli, zucchini, snow peas and many others often being added to make a complete meal. Add more spices like garlic powder, cumin and red pepper flakes to this Spanish rice recipe if you like spicy foods. Put ground beef, onion, green pepper and rice in hot olive oil. Stir over high temperature until lightly brown. Add remaining ingredients and mix well. Bring to a boil, cover with lid and simmer for 25 minutes. As in many of my beef and rice recipes I leave the option of spices for you to choose if you like spicier foods. This steak and rice recipe is good with a little chili powder added. I almost always add some form of garlic but usually vary the other spices. In a large skillet melt the butter. Add the meat, beef broth, canned tomatoes, onions, Worcestershire sauce, salt, and pepper. Stir well and cook for 10 minutes. Bake in a greased casserole dish for 40 minutes. This stir fry rice recipe is one of the beef and rice recipes already deliciously flavored with an Asian flair. Combine soup, cornstarch, soy sauce, peanut butter and red pepper flakes in a small bowl and stir to blend; set aside. Cook meat in 2 tablespoons hot oil with the garlic until the meat is done; remove from skillet. Add remaining 1 tablespoon oil into the skillet. Add the frozen vegetables and stir fry 3 to 4 minutes. Return beef to the skillet. Stir soup mixture and add to the skillet. Heat to boiling and cook for 1 minute. Serve with the rice. Brown ground beef and onion in a large skillet; add tomato sauce and spices and simmer 15 minutes. In a bowl combine cooked rice and cottage cheese; place 1/3 of rice mixture in buttered casserole dish. Top rice with half of beef and sauce mixture; top with another 1/3 of rice mixture. Top rice with remaining half of meat and sauce mixture; top with remaining third of rice mixture. Sprinkle top with shredded Cheddar cheese; bake for 30 minutes or until bubbly. This is one of the beef and rice recipes in which the vegetable, zucchini is the center of attention. 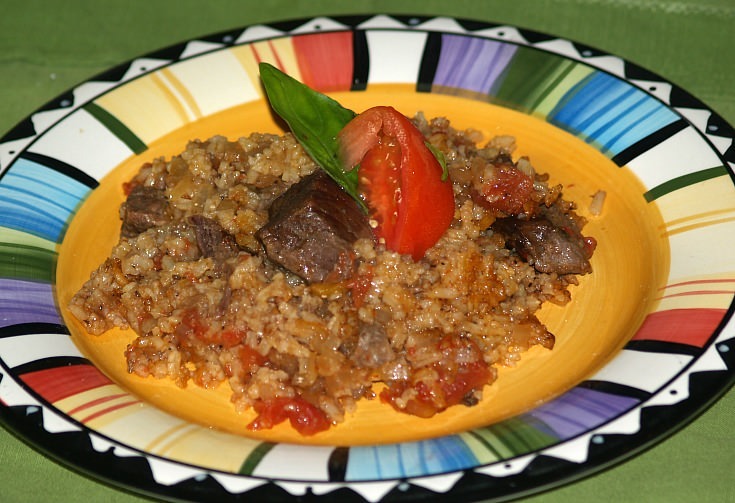 Brown beef in a large skillet; add onion, rice, parsley, savory and water. Cover skillet and cook about 20 minutes or until rice is tender; add salt and pepper to taste and stir. Cut zucchini in half and remove seeds; cut in chunks and place in bottom of buttered casserole baking dish. Cover zucchini with beef and rice mixture; top with grated cheese. Bake for 30 minutes or until zucchini is tender.